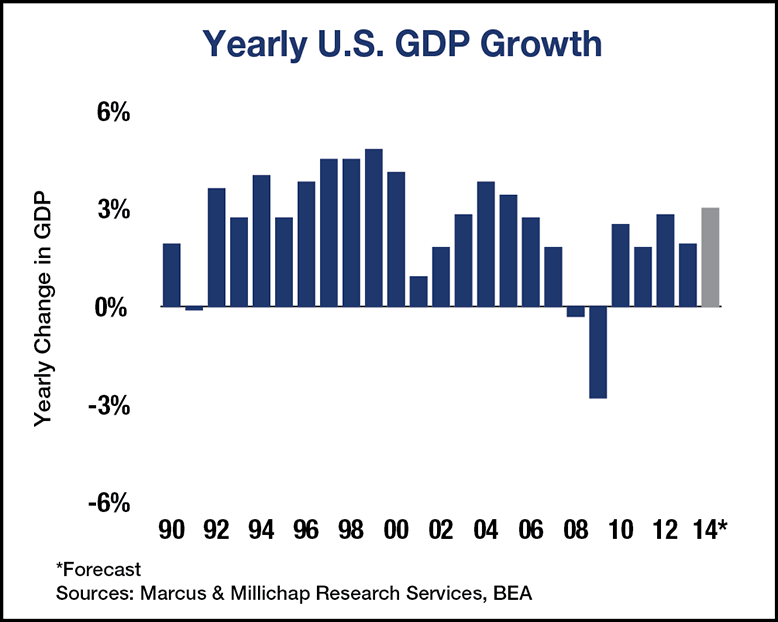 Led by a resurgence in consumer spending and devoid of many of the headwinds that restrained the economy over the last few years, economic growth in 2014 should surpass 3 percent, its highest level since 2005. Last year, GDP advanced 1.9 percent, though outsized gains in the second half of the year lend credence that the economy is on solid footing. As the private sector firmly grabs the reins of the recovery, government intervention is dwindling. The Fed has begun to unwind their economic stimulus and should close out its quantitative easing by the end of the year, while midterm elections should restrain legislative initiatives that impede economic growth. GDP grew 3.2 percent in the fourth quarter, lifting the second-half pace to 3.7 percent, the strongest six-month rise since 2003. Consumer spending jumped 3.3 percent in the fourth quarter, marking the most significant gains since late 2010. Since two-thirds of the American economy is driven by consumption, the advance is an encouraging sign for the long-term economic outlook. Exports were also a strong contributor during the quarter, an indication that global economic momentum is improving. Two components dragged on economic growth last quarter: government spending and the housing market. The partial government shutdown and reduced spending from sequestration resulted in a 90-basis points deduction from GDP growth. The reduced hours worked by government employees during the shutdown alone sapped at least 30 basis points from the economy. Housing, meanwhile, is adjusting to a higher interest rate environment amid higher home prices. The recent increase in valuations has priced many potential buyers out of the market while eliminating the viability of single-family homes as investment vehicles. A consumer-led economic expansion will pay dividends for retail property owners this year. Space demand is anticipated to rise 1.6 percent during 2014, pulling down the overall vacancy rate by 60 basis points to 6.6 percent. For multi-tenant centers, the vacancy rate will decline to 8.5 percent. Although a cooling housing market is dragging on the pace of economic expansion, higher prices will benefit apartment operations. For the first time since the housing bubble burst, the payment on a median-priced home exceeds the average rent. The strengthened renter demand will come as the nationwide inventory expands by 1.5 percent. Despite this construction surge, vacancy will finish the year up just 20 basis points at 5.1 percent. This entry was written by marcusmillichap, posted on January 31, 2014 at 6:50 pm, filed under Uncategorized and tagged CRE, GDP. Bookmark the permalink. Follow any comments here with the RSS feed for this post. Post a comment or leave a trackback: Trackback URL. Wish you were more guarded with over 11% of in real unemployment and substantial under employment, with major tax increases and substantial inventory build up. Please give this sufficient consideration. So… 2014 will be “devoid of many of the headwinds that restrained the economy over the last few years….”? Frankly, I just don’t see it. I am trying to be an optimistic — even starting my own retail business to replace a vacating Walgreens tenant in a shopping center my wife and I own — but I am very, very concerned about the pent-up pressures in this economy. Obamacare is already presenting this country with a huge body slam that will impact this economy in ways that remain mostly impossible to anticipate. It’s a disaster — and as people get the news from their employers about their higher premiums, deductibles and co-pays, we should expect nothing other than a very significant impact on the economy. Personal discretionary income will be stretched even more than it already is.